Florida is a great environment for all manner of animal life from insects to giant reptiles—some native and others introduced from elsewhere. Most of them you will never or rarely encounter, but there are others that you may well find yourself getting up close and personal with. If you move here, trust me, you’ll soon be on a first-name basis with your friendly exterminator. Let’s start with the termite, for which Florida’s warm, moist climate is the Promised Land. Now, termites are not exactly unknown in other parts of the country, but here they are practically unavoidable. When I first came to Florida, I noticed houses that were totally encased in blue plastic. I soon learned that they were being “tented” for termites. This is a process in which the occupants of the house move out temporarily after removing or bagging up any food and other vulnerable items and then the house is covered by a gas-impermeable tent into which poisonous gas is pumped to kill the termites and any other living creatures left inside. With a little luck, the treatment is good for about six or seven years, and then it has to be done over again. If you don’t have your house inspected and treated regularly, you are quite likely to find that it has become lunch for a thriving termite colony. But it’s not just termites. I was sitting at home one night this spring when I noticed that there seemed to be things crawling across my TV screen, and then they were on my computer screen, and then they were everywhere there was a light on. I swatted some and looked closely at them, and they looked like winged ants. I had never seen any of these the first year in the house, and my initial fear was that they were termites. However, when the exterminator got here, I learned that they were carpenter ants, which while noxious and undesirable, were a rung or two lower on the destructive insect scale. Still, it took multiple visits from the exterminator to get rid of them, and meanwhile I couldn’t even read in bed because the lamplight soon had them crawling over me like a low-grade horror movie. Then there were the “ghost ants”—tiny, almost microscopic light-colored ants that would appear in astonishing numbers as if by magic whenever sugar or anything sweet was left on the kitchen counter. I quickly discovered that Windex would kill them instantly, but new ones just kept coming. And they were so small that they could get into anything, which had me resorting to keeping the sugar in the freezer. Again, it took my trusty exterminator to get rid of them. But my personal nemesis has been the raccoon. I have a pool, and raccoons are attracted to water, and my verdant village on the north side of Miami turns out to be home to large numbers of what the French-Canadians call the raton laveur (washer rat). People think raccoons are cute, but get close to one and you will find that they are nasty-tempered and aggressive critters—the gangsta thugs of the suburban jungle. They are also particularly susceptible to rabies. So off I went to Home Depot and bought a Havahart trap. (Note to the tenderhearted: These are traps designed to cage, but not harm, the animal.) I set it, and bingo! 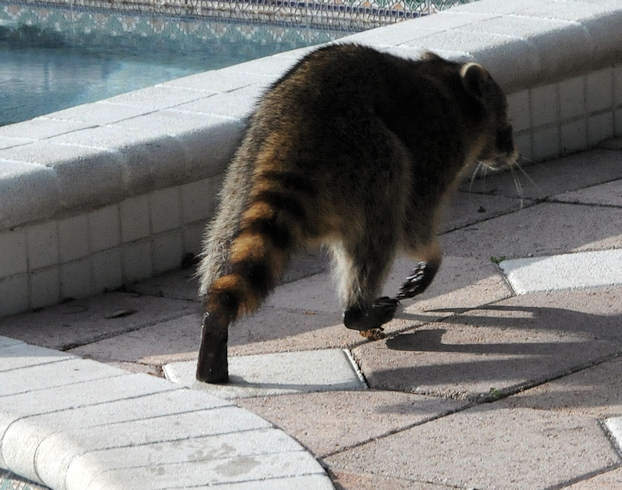 A very unhappy raccoon—big as a large cat–was waiting there the next morning. Then I took him (or her) over to a state park and released it into the wild, thinking my problem was solved. Alas, it was only the beginning. 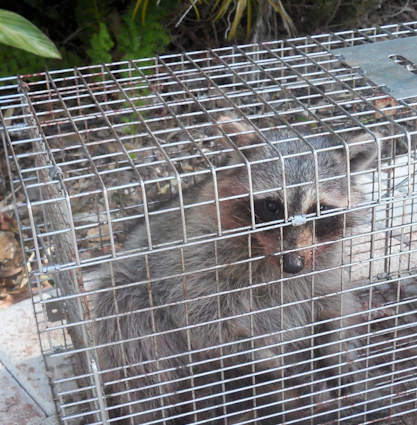 Let’s just say that since then I have trapped six or seven raccoons (I’ve lost count) and released them into the wild. I know there will be more, but it helps for a while. I think of it as something like the English transporting pickpockets to Australia—they may not like it at first, but they’ll be happy there in the long run. Raccoons are cunning creatures and sometimes manage to eat the bait and get away without dropping the trapdoor, but if you’re persistent, like other criminals they will eventually slip up. I’ve also caught two feral cats and a ‘possum in the trap. I just let them go, figuring they weren’t doing any harm, although the damn ‘possum just lay there playing, well, possum and refused to budge until I propped open the door and went away. He eventually got up and slunk off into the bushes. There are also some critters that I really love, and these include the lizards that scamper around my yard. I don’t know exactly what they are called, but there are at least four species that I have seen. One is pretty certainly a chameleon—normally a brilliant chartreuse green, but capable of changing colors at an amazing rate. Another one has a bright red wattle that he displays at certain times. For a while, I was concerned that their numbers were decreasing and suspected that one of the wandering cats was eating them, but they seem to be back in numbers. They are harmless, fascinating, and they eat insects. What more could you want?